We specialize in both residential gutter cleaning and commercial gutter cleaning in Memphis, TN. We use our gutter cleaning system to clear all leaves and loose material from your gutters. Then we will pressure clean all hard to remove material using our pressure cleaner. 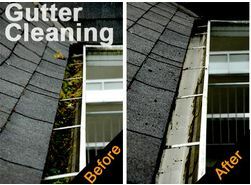 We can even clean the outer shell of your gutters. You can be assured that Pearl Window Cleaning in Memphis will remove all debris and leave no mess.